导弹发射显示中国的东风26能在飞行中调整姿态 [美国媒体] Missile-launch shows China’s DF-26 able to adjust position mid-flight. 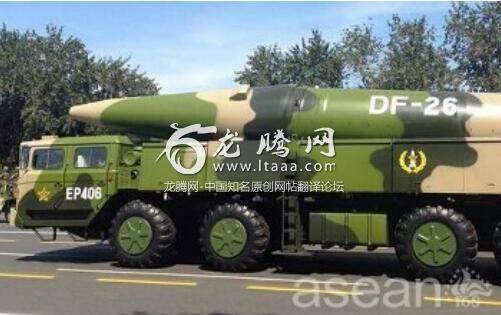 Missile-launch shows China’s DF-26 able to adjust position mid-flight. When the adversary realised that war is not an option, that's when countries begin to sit down and talk in a civilized way. The world welcomes China's latest developments because the world wants peace. May the FORCE be with you. stupid american, you thin kchina deosnt have icbms?? in large nubmerS?? with multiple warheads? If anyone thinks that another country can attack the United States killing thousands of Americans with impunity then they have made a fatal mistake. The President would be forced to deliver a crushing military response. If he didn't he'd be assassinated. If the US were attacked once with impunity it could happen again and again. Despite what you hear about Russia and China having super weapons the US still has the most powerful military in the world. When provoked the US is also the most violent nation on earth. What's more all of NATO would be forced to respond as well. The United States is prepared for WWIII. Tens of millions of Americans believe it is a necessary event for the second coming of Christ. However crazy that might sound to you that's what they believe and are actually looking forward to it.